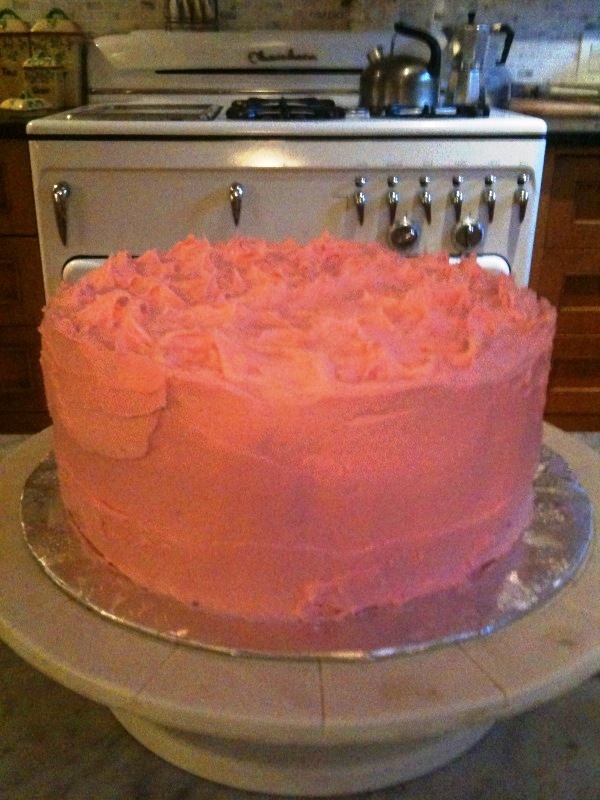 For several years, I baked and sold red velvet cakes to a couple of local cafes. 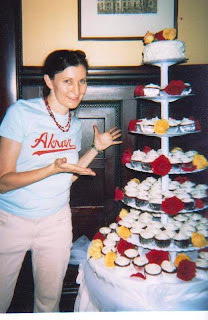 I even made the wedding "cake" -- 200 red velvet cupcakes -- for a wedding at the Montauk Club. All this was back when red velvet cakes were a special treat. Now, they are everywhere, from Duncan Hines mixes to the corner bodega. I would bake two cakes at a time (my decidedly non-commercial oven could only accommodate four round pans), and the ritual became so routine that I felt like I could put these together in my sleep. The only excitement was trying to shave off time, to try to top my personal best which, if I recall correctly, was two cakes baked and frosted in 1.5 hours. I couldn't cut the time down much more, because the layers had to cool before frosting. So when DH asked me last week to bake a red velvet cake to serve colleagues at a screening at work, I resisted. I once heard that Billy Joel had stopped performing his perennial favorite, I Love You Just the Way You Are, when mid-song on stage, he found himself thinking that if he could get to his hotel by midnight, he could still order room service, all the while continuing to sing. His heart clearly wasn't in the song. My heart clearly wasn't into making a red velvet, but I complied. After all, DH would do it for me (if he baked, that is). Of course, the cake was a huge hit at his office; I got lots of emails from his co-workers using all manner of adjectives describing the deliciousness of the cake. It is a good cake. It's very moist (thanks to the vegetable oil), sweet and pretty. It's just so predictable. And baking without the possibility of surprise isn't thrilling at all. Even if it is a guaranteed crowd pleaser. Love the Billy Joel analogy! Interesting about "baking without the possibility of surprise." Trust me, I could ruin the red velvet cake. I read your blog ever since my mom sent me the link, and it's so interesting! I think Laura reads it too. 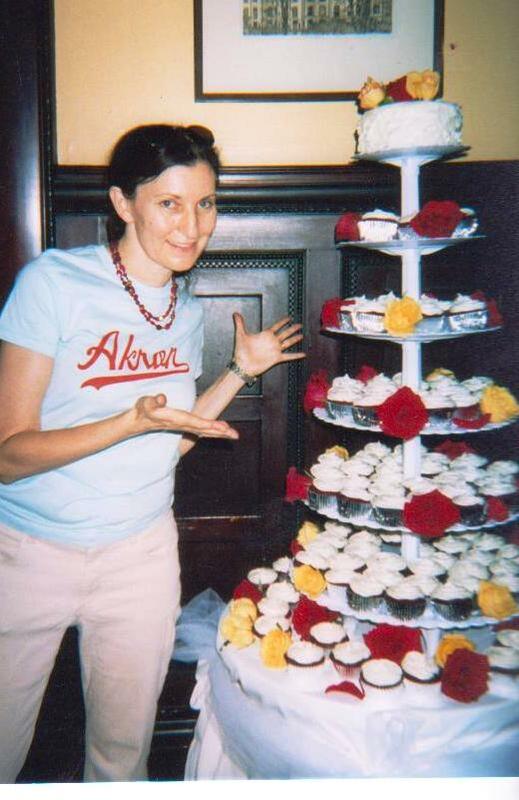 I honestly still think about a red velvet cake you made for my family when I was maybe 12 or 13 years old when we visited you all in Brooklyn one time- it really was the best red velvet cake I have had before or since. It's true that red velvet cake is more prevalent now, but not necessarily red velvet cake that good. . .
don't retire it forever until i get a chance to try some! @Jessica: You can make it perfectly. And the Billy Joel analogy was told to me by Paul. I *think* it's true. 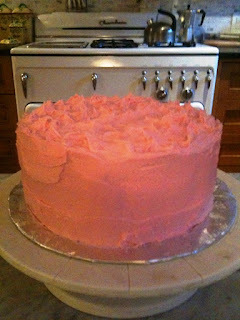 @Nicole: So glad you (and Laura) like the blog and have such fond memories of the cake. @Betty: What great praise, especially from a journalism professor! Thanks.